(20 March 2018) The unprecedented streams of displaced people fleeing war, instability and natural disaster toward the continent of Europe starting in 2015 has now ebbed to a steady trickle. Tens of thousands of asylum-seeking children – both accompanied as well as unaccompanied or separated from their parents – are now living across the Euro-zone. These children are mostly living in limbo while immigration machinery slowly churns through their cases. As part of UNICEF’s global “Children Uprooted” campaign and its attendant 6-point Agenda for Action, UNICEF Innocenti has recently completed a technical report analysing legal and procedural standards for asylum-seeking children in Nordic countries and the extent to which they are being correctly applied on the ground. Despite a world-leading record of commitment to child rights, Nordic countries are failing to provide the full range of protection and services required for asylum-seeking children. The new report Protected on Paper? An analysis of Nordic country responses to asylum-seeking children, finds that, despite proper legal and procedural measures being largely in place, implementation lapses expose many asylum-seeking children in Denmark, Finland, Iceland, Norway and Sweden are exposed to significant risks in the asylum-seeking process, as well as critical gaps in protection, healthcare and education service. The research project led by Bina D’Costa, lead migration research specialist with the UNICEF Office of Research, was commissioned by the UNICEF National Committees in the Nordic region to get an independent research perspective on the services provided to children during the asylum seeking process. It is intended to support dialogue with the respective Governments on what standards and procedural safeguards must be adopted, adapted and/or implemented, to ensure that the rights of asylum-seeking children are fully respected. The research embraced a critical, holistic and multifaceted approach using a primary research lens to get data from qualitative research in the countries. Primary data were collected through semi-structured interviews with key respondents in the region. Secondary data were drawn from a review of the literature on refugees and migrants in Europe and in the Nordic states, and from European databases, research and studies. Data obtained from both sources were used to assess national responses to asylum-seeking children by measuring each country’s activities in five child-related domains: general context; asylum procedures; education; health; and child protection, against international best practice standards.Overall Protected on Paper? documents a clear tendency in all five Nordic countries to give precedence to migration law over international obligations under the Convention on the Rights of the Child. In many instances immigration officers, as opposed to child protection specialists, are tasked to make critical decisions and coordinate urgent care for children. Child protection is not the primary priority of asylum agencies. In addition, in many cases, the child’s legal status substantially determines their access to entitlements. The new study offers clear directions on how to better integrate children in the protection system with a focus on determining the best interest of the child, a key principle of the Convention on the Rights of the Child. 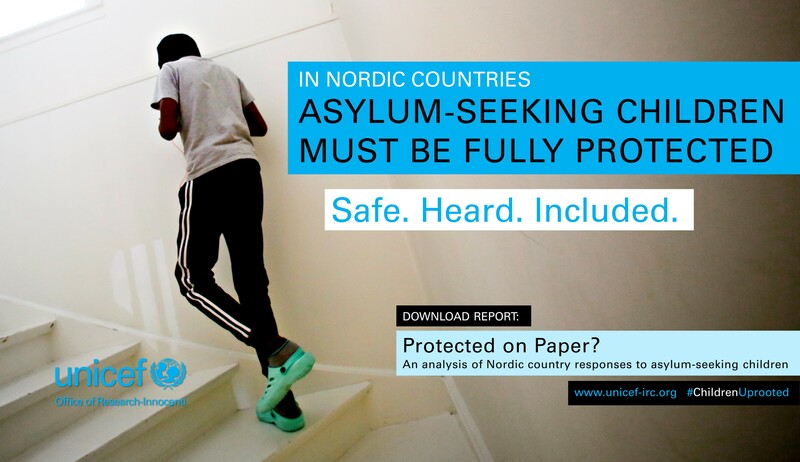 However, the study reveals that the lack of clear protocols and formats in all Nordic countries to determine best interests leads to poor quality assessments and gaps in good practice, with the result that there is no consistency across the region in terms of who undertakes best interest determination; at what stage of the asylum process; or the purpose and function of the asylum process. Protected on Paper? highlights the importance of having independent mechanisms for providing oversight of asylum services and facilities, including for guardianship. The representative or guardian is often the unaccompanied child’s primary source of support throughout the asylum process. Therefore, it is urgent to ensure that they are both independent and competent through the development of a common set of standards for their recruitment, training, supervision and support by child protection agencies. However, while children are allowed to complain about their guardian, it is not apparent that they have any real say in their appointment. The report recognizes that in Nordic region asylum-seeking children can generally access basic medical treatment, but the extent of the services available to families varies widely between states and municipalities. Moreover, there is strong evidence that a significant number of children in the post-2015 mixed migration movement have been exposed to physical and psychological trauma. Education systems in all five countries adopt an inclusive and gender sensitive education model and teachers working at all levels are familiar with the concepts and practice of inclusive education. However, Protected on Paper? highlights that asylum-seeking children’s entitlements to education do not seem to be fully enshrined in law in all five countries, often due to differences in perceptions and perspectives when it comes to inclusion of asylum-seeking children. As an example, although all five Nordic States try to facilitate access to Early Childhood Education for asylum-seeking children, their entitlement to it is not necessarily safeguarded but rather negotiated between the receiving municipality and the asylum authorities. In addition, ECE programmes based in reception centres do not always meet the same quality standards as community-based services. 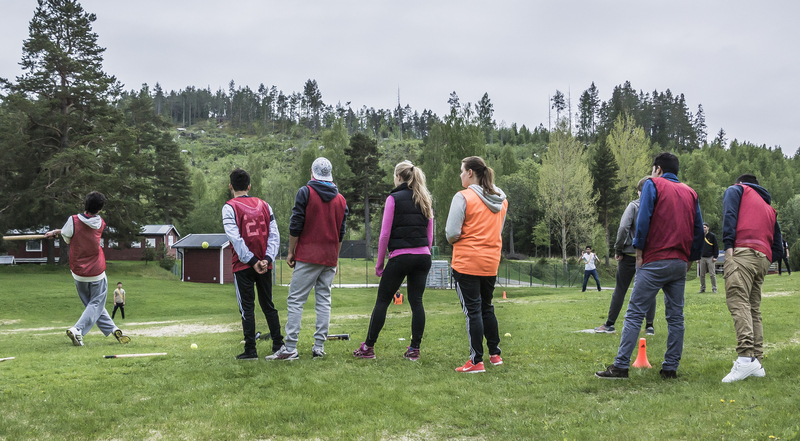 Children and youth, some of whom are seeking-asylum, playing sports in Sweden. Protected on Paper? puts in evidence the lack of basic data at central government level about asylum seeking children held in detention. All five States allow detention of children for return purposes, and the criteria to justify and enable detention are quite broad, and usually relate more to easing authorities’ implementation of asylum decisions than to protecting the child’s best interests. Generally, national law prohibits detention of children under 15, but younger children can be detained with parents, and time limits on their detention also seem somewhat elastic in the Nordic States. In some cases, asylum-seeking children have been forcibly returned with their families, while unaccompanied or separated children deported on reaching eighteen years of age.